Do you know someone who is sick right now? HA! Trick questions...practically everyone I know is sick or has a family member with a cold, stomach flu or random virus. Even this morning as I prepared to go outside into the wind for a run, I was stuffing Kleenex in my pockets. So is it okay to exercise when you're sick? Well, it kinda depends on what kind of "sick" you are. If you have the common cold, it’s okay to work out; in fact you might even feel better.Studies have shown that exercising with the common cold (runny or stuffy nose, sore throat) does not have any negative impact on the body. In fact some participants reported feeling better after exercising with a cold. So just keep these guidelines in mind and feel better soon! If your illness is “above the neck” (think head cold, runny nose, sore throat), keep up with your exercise routine. If you are vomiting, have diarrhea or a chest cold, take it easy until your symptoms lessen. Also, if you have a fever or severe body aches, it’s a good idea to take the day off from your fitness routine. Of course, if you question your ability to work out when your sick, double check with your doctor. Anyone else a little chilly today? Well...exercise makes you warmer! 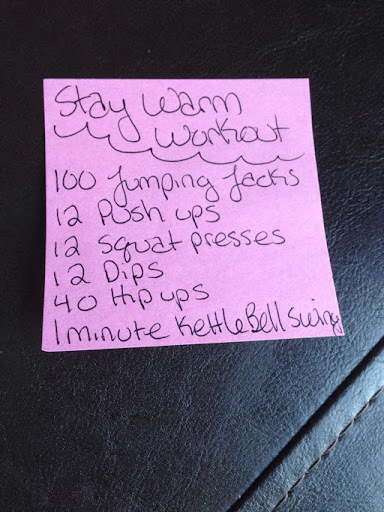 Do this sticky note workout whenever you feel chilled and you'll burn calories, do good things for your heart, bones and muscles and warm up in no time! A new-to-me veggie to try! So I was talking about healthy foods with one of my clients the other day and she mentioned that her new favorite thing to roast was rutabagas...what? 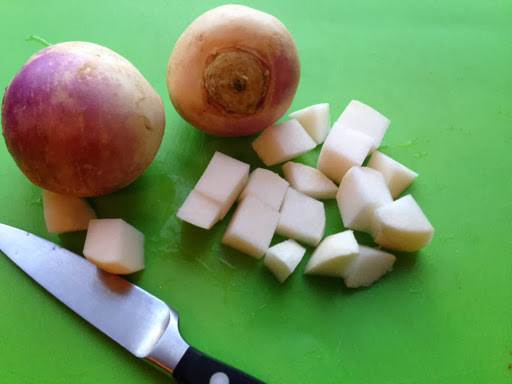 I'd never had a rutabaga before and now I'm a bit obessed. Thanks EM for the introduction to this root veggie that is loaded with vitamin C, zinc and fiber. This is a super easy way to prepare it (after roasting it tastes like something between a radish and sweet potato...sooo good). Joining a gym? Read this first! Congratulations! You’ve decided to join a gym to get in shape. Before you hand over your hard earned money, did you know a staggering 67% of people who pay for gym memberships never use them...what?! Don't be a sucker; join a gym that is right for you and your goals. Here are several areas to investigate and questions to ask to make the right choice for you! What is the cancellation policy? Life changes, so make sure that there is a reasonable cancellation policy in case you need to quit your membership. Some gyms require a 30 day written notice while others have lengthy contracts that are difficult and expensive to break. Know what and how long you’re signing up for before you sign on the dotted line. So Center For Disease Control (CDC), over 67% of adults are overweight or obese. No wonder over 80 million Americans go on diets every year and spend an excess of $30 billion dollars on diet programs and products. But the sad part of this is that most people who are trying to loose weight do not succeed. In fact, some have estimated that about 95% fail at sustained weight loss endeavors. That is a huge waste of money and time without improving health. So what can you do to increase your odds of success? Simple...write it down! If you're a client of mine, past/present/future, you will know that I LOVE food journaling. Writing down your goal, what you eat every day and your exercise DOUBLE your chances of weight loss success. And how easy is that?! Super-duper easy (I log my food every day to keep on track). Take the following three steps to succeed in your diet and be a healthier you! 1. Buy a journal or download an app-see #3…or notebook or grab a pad of paper. Yep…this seems simple, but if you don’t have the tools, you can’t start writing things down. It can be anything…a leather bound book, a sticky notepad, a smartphone app or website; anything that you want to designate as your Healthy Living Journal. Don’t use your journal/app/website for anything else, just your goals, food and exercise. • Tell the world. This is an important step in the road to victory. Tell your friends, co-workers, family, even the cashier at the grocery store that you are vowing to quit smoking, lose 10 pounds, or get to the gym 4 days a week. When your will wanes, the peer pressure that you’ve created for yourself will help you keep on track. AND if you decide to go digital with your food log, you can ask a friend to keep you in check by having them view your log every once in a while (myfitnesspal makes this especially easy). • Be positive. Ever heard of the Little Engine that Could? With her mantra of “I think I can, I think I can I think I can..” she accomplished her goals. Even though the mountain was steep and took a lot of hard work, she kept positive with her eye on the prize.